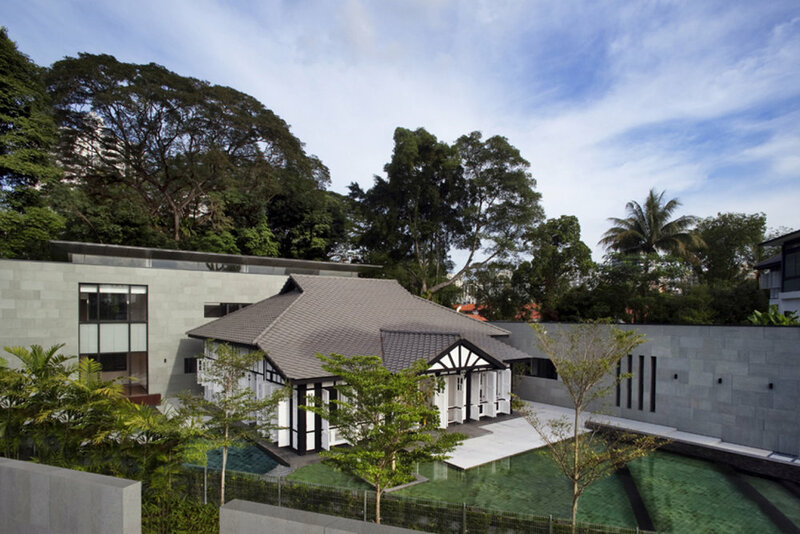 This conservation project pivots around a classic Black & White House built in 1920, one of four bungalows used by staff of European trading company, MacAlister & Co. Due to the lack of maintenance by previous owner, the bungalow was left for years in a state of dilapidation. It was the client’s desire to restore the glory of the former Black & White House while preserving its unique qualities and place in history. The dedication and sensitivity to the spirit of conservation is demonstrated via the overall black & white scheme within the conserved house; the sensitive choice of materials and design for the two new annexes which form the backdrop to the black & white house. By juxtaposing neutral grey colour stone walls at 90 degree angle as backdrop, 2 new blocks which house all the bedrooms, kitchen and family room were inserted, framing the Black&White House.